HONG KONG, June 29, 2018 /PRNewswire/ — PwC Hong Kong ("PwC") has entered into an investment agreement today with Vitargent International Holdings Limited ("Vitargent"), a pioneer in bio-testing technology for product safety. This is PwC’s first proposed investment in the biotechnology and internet platform space, bringing together the strengths of PwC and Vitargent to address evolving challenges in food and consumer product safety across Greater China and beyond. PwC has entered into an investment agreement today with biotech and internet platform company Vitargent. 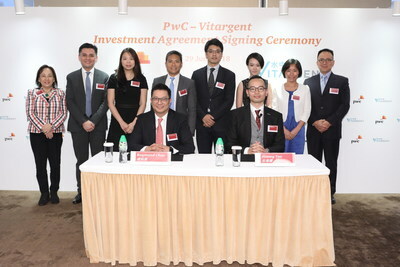 Raymund Chao, PwC Asia Pacific and Greater China Chairman, and Jimmy Tao, Chief Executive Officer, Vitargent, officiated at a signing ceremony held in Hong Kong today. Vitargent is an award-winning biotechnology company specialising in product safety testing with its pioneering fish-embryo based toxicity testing technology. Backed by 10+ institutional investors and with input from its Scientific Advisory Board comprising experts from across the globe, Vitargent’s technology is serving 50+ leading companies and organisations including governments, research institutes, testing laboratories, major international skincare and cosmetics companies, food manufacturers and catering groups around the world. Since forming a strategic alliance earlier this year in February, PwC and Vitargent have worked collaboratively to build a professional team of over 30 experts, actively providing a holistic one-stop solution to food manufacturers and suppliers to improve their quality of products and giving accreditation to companies that offer excellent quality. Vitargent also issues Test-it™ reports and safe-to-buy product lists to the public with PwC as a strategic partner providing professional services and a foundation for public trust across our markets. Our combined expertise brings these product safety resources to market equipping the public with better knowledge to make safer choices, and serving as an important tool for consumers to gain trust in brands and manufacturers. Raymund Chao says, "We are delighted to establish a deeper relationship with Vitargent, whose innovative testing solutions complement PwC’s professional capabilities to tackle longstanding challenges in food integrity. This investment agreement is a significant step in furthering PwC’s purpose of solving important problems and building trust in society. By staying at the forefront of food safety innovations, PwC aims to reinforce our end-to-end services to help clients strengthen their competitive advantage, enhance consumer confidence and protect and enhance their reputation. Looking ahead, we are ready to deliver greater value to the food and consumer markets, with a focus on driving commercial growth while balancing that with consumer trust and regulatory concerns. Together, we can work towards building a safer and more sustainable future in food and other consumer products." Jimmy Tao says, "We are pleased to have PwC’s support in solving food safety issues and enhancing public trust in food supply. Food safety measures must be prioritised, in view of the global food safety violations and recalls of food in supply over the last decade. We will work closely to ensure food manufacturers and suppliers, across Greater China and beyond, will benefit from Vitargent’s advanced bio-toxicity testing technology, which provides early warnings to unsafe products and helps avoid potentially disastrous consequences. By sharing our industrial experience and expertise, we are setting a safety standard that is beyond regulatory requirements. We are building the world’s largest database of bio-data for consumer products that will add value to business and instil confidence to consumers and other stakeholders." With nearly 15 years of biotechnology research and development and achievement by the co-founders, Vitargent commercialised the technology in 2010 with the vision of "Smarter Testing, Safer Products, Better World". We are a pioneer in the field of applying fish embryo-based toxicity testing technology to ensure product safety. We are the proud winners of the Grand Prix at the International Exhibition of Inventions of Geneva (2015). We are backed by 10+ institutional investors. With hands-on guidance from our world-renowned Scientific and Business Advisory Boards, we combine technological expertise with social responsibility. We aid manufacturers to improve product safety and enhance consumers’ confidence in making safer purchases. We have served over 50+ top-notch testing organisations, governments, research institutes, major international skincare and cosmetics companies and catering groups around the world. With the firm support of these entities, we are working towards incorporating the technology into regional and international safety standards. Test-it™ is the consumer information product safety platform under Vitargent, the world’s first with Testing 2.0 bio-testing technology. It provides information for consumers to access in everyday lives. Find out more by visiting us at www.fishqc.com. At PwC, our purpose is to build trust in society and solve important problems. We are a network of firms in 158 countries with more than 236,000 people who are committed to delivering quality in assurance, advisory and tax services. In China, including Hong Kong, we have over 18,000 people and are located in 23 cities. Consumer confidence around food safety is a very significant societal concern, China’s food sector is evolving rapidly. PwC’s Food Supply & Integrity Services combine food industry expertise with our capabilities in risk management, internal controls, supply chain, strategy, compliance, capital markets and M&A to help our clients achieve lasting success. Our services enable a variety of clients to deliver safe, quality food while building growing and profitable businesses.